With this project, Engaging the Senses Foundation is helping to fulfill our commitment to raising awareness about our collective responsibility for the earth and her sustainability. This film is a profound call to action. In an era when we’re facing the knowledge that our world itself is in peril due to climate change, a project that focuses on light, on solutions, and on the transmission of hope is a cause for celebration. 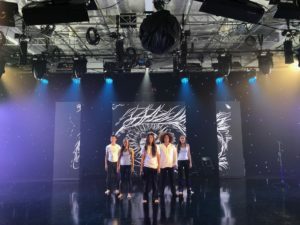 And so we’re excited to announce that we recently filmed an extraordinary project,“The Story of Everything” – an original creation story that infuses science, storytelling, poetry, movement, music, visual art, and chanting– created by Kealoha Wong, the first Poet Laureate of Hawai’i and an honored MIT Nuclear Physics graduate. The film is produced by Engaging the Senses Foundation and directed by our Director of Production Ron Singer, whose credits include “Mississippi Requiem” (executive producer) among many other projects. Kealoha created “The Story of Everything” several years ago to celebrate the impending birth of his son so that he could explore with him the fundamental question, “Where do we come from?” Through this piece, made possible through the support of a Native Arts and Cultures Foundation Community Inspiration Award, Kealoha dramatizes explanations for human origin, drawing from sources both diverse and interconnected, including the Big Bang Theory, disco, physics, biology, Michael Jackson, and the Kumulipo, a sacred 18th-century chant in the Hawaiian language that tells a creation story. TSOE also features visual art projections by Solomon Enos, music by Taimane Gardner and the Quadraphonix, and oli — traditional Hawai’ian chanting — by Kaui Kanaka`ole, a kumu hula (master) of the hula dance form. The performance is enhanced by the dance skills of Jamie Nakama, Jory Horn, and Jonathan Clarke Sypert. Now in post-production, the filmed version be completed after we finish filming a live theater production of “The Story of Everything” on March 22, 2019, at the historic Hawai’i Theatre Center (soon to celebrate its 77th birthday!). We’ll keep you updated on film premieres and viewing opportunities, and feel we can say with no hesitation that this film will be a game-changer for anyone who has the privilege of seeing it. Take heart, it says, for we are a part of the cosmos, part of Earth, and a part of the solution for cherishing and preserving her.